As I mentioned in my Salzburg post from a few weeks ago, the Sound Of Music bus tour I went on didn't stop at any of the shooting locations within the city's core. While a number of those locations were pointed out to us, the tour was focused on the filming locations outside of Salzburg. These lie mainly in two directions: east of the city and directly south of it. We ventured south first. Schloss Leopoldskron (Leopoldskron Palace) as seen from across Leopoldskroner Weiher (Leopoldskron Lake). "Two different locations were used for filming the back of the Trapp Villa, which made for some tricky camera angles and acting. Frohnburg was used for the actual house - but not the terrace and the lake. Scenes with that backdrop were filmed at another location, a house known as Bertelsmann. For the scenes that show both the back of the house and the lake with its terrace, we had to act (and film) in both locations. 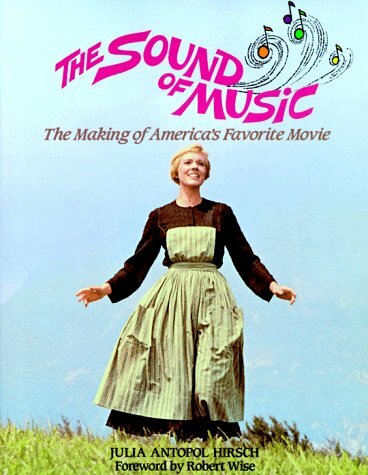 For example, when Maria is shouting at the Captain on the terrace, Julie [Andrews] is standing on the steps at Fronburg. But when the Captain responds to her, Chris [Plummer] is on the set at Bertelsmann." At Bertelsmann, the grounds were inspired by those of the neighboring Schloss Leopoldskron. 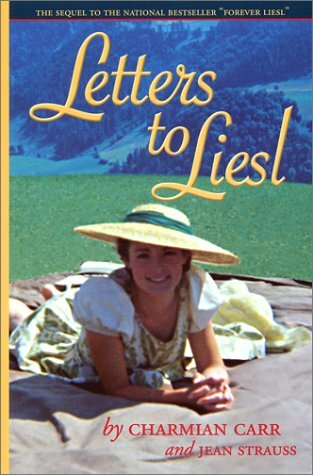 The production had wanted to film at Leopoldskron, but were denied and so duplicated its grounds at Bertelsmann. 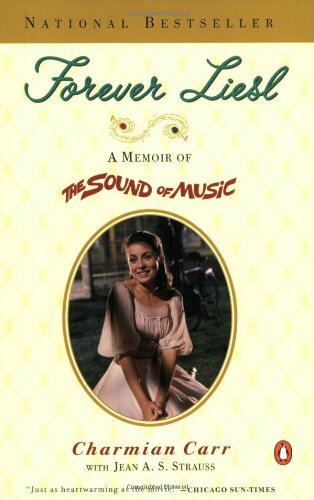 Additionally, all of the scenes that show the interior of the Von Trapp Villa were shot on a southern California soundstage as were all of the gazebo interiors. Some sets, such as the ballroom, were inspired by actual rooms within Schloss Leopoldskron. A closer shot of Schloss Leopoldskron with the south side of Festung Hohensalzburg visible at the upper left. Schloss Leopoldskron was the first of our southern stops. I don't recall our guide being as clear as Charmiane Carr. In fact, I seem to remember him stating that Schloss Leopoldskron was in fact the location for the back of the Von Trapp estate! 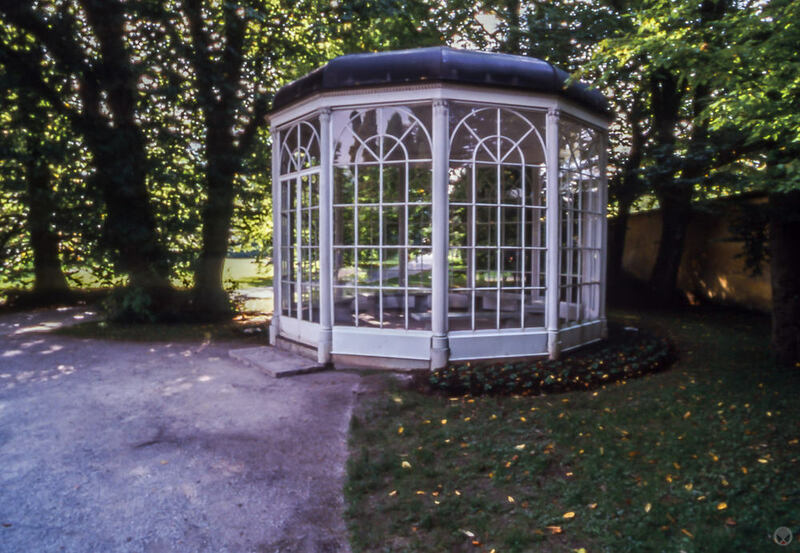 He did mention that the gazebo used to be on the grounds (actually the grounds of the neighboring Bertelsmann), but was later moved off the estate and down the road - very near to vantage point from which the above photos were taken. Apparently, the owners of Bertelsmann grew tired of tourists sneaking on to the grounds to visit the gazebo. Eventually, due to concerns of vandalism, liability, as well as the privacy of the residents in the area, the gazebo was relocated yet again. This time it was moved several miles south to the grounds of Schloss Hellbrun, where it sits today. It's located behind the wall, but just inside the gate and the grounds are open daily to visitors. Due to liability issues, the gazebo itself is locked as too many tourists injured themselves attempting to replicate the dance routine from the film on the benches within. Just outside and immediately north of the Schloss Helbrun gate that leads to the gazebo, is the tree-lined road, Hellbrunner Allee. Roughly 1.5 km down the this road is Schloss Frohnburg - which, as you might recall from Charmiane Carr's description above, doubled as the exterior of the Trapp Villa (front and back). The Villa is closed to the public and the road is narrow - which is probably why the bus didn't take us there, but you could walk or drive it on your own if you wanted to see the front of the villa - including the wall that Maria (Julie Andrews) walks alongside of while singing the last part of "I Have Confidence." We next headed toward the lake district east of Salzburg. The montage of arial views that opens the film was shot at a number of places around Salzburg. There are a few shots of the area around Mondsee as well as a number of others that were taken in the vicinity of St. Gilgen and Wolfgangsee. Additional shots feature the town of Anif, south of Salzburg and the town of Anger, across the border in Bavaria. The bus tour went as far as Mondsee. 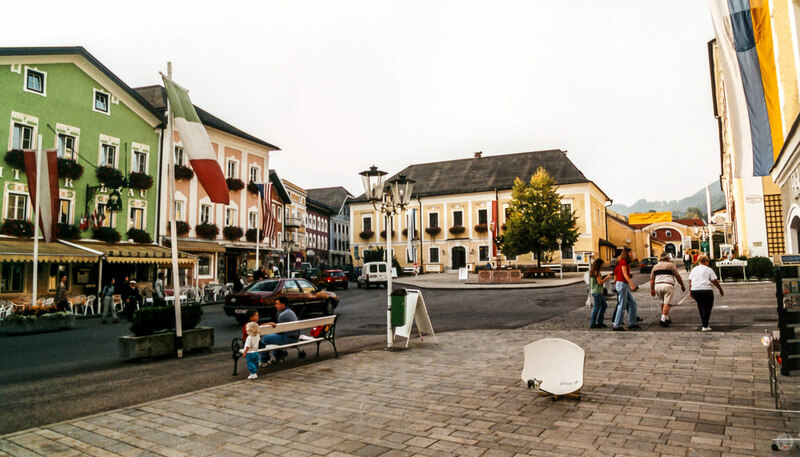 Mondsee, as seen from the town of the same name. 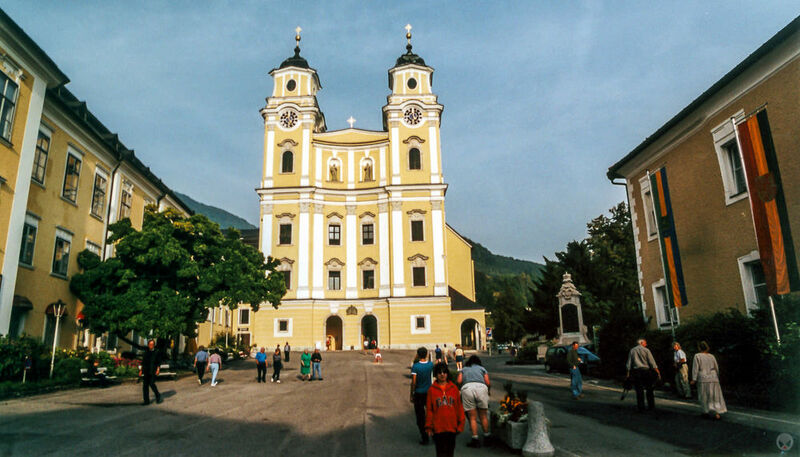 The Mondsee Cathedral was the main focus of this leg of the trip as it was where the wedding scene between the Maria and Baron von Trapp was filmed. We were allowed inside, but it was too dark to get a usable shot without my tripod, which I had left back at the hotel and which probably wouldn't have been allowed anyway. In today's world of digital cameras and high ISO's, that same shot can now be taken hand-held. During this part of the tour, we were told by our guide that the opening shots of the film, including Juile Andrew's famous twirl, as well as the "Do-Re-Mi" picnic scene were all shot in this area. I've since learned that while the opening helicopter shots were filmed here, several of the others were actually filmed on private lands south of Salzburg. 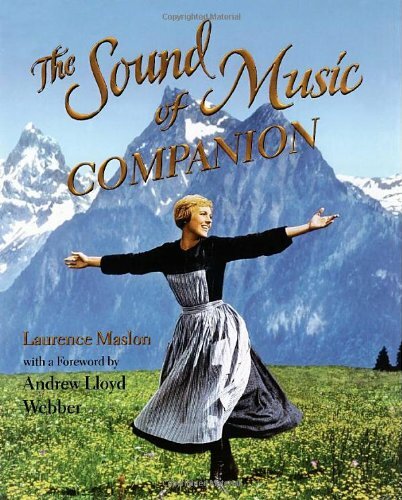 Andrew's twirl and "The Sound Of Music" title song were filmed in an alpine meadow on a hill known as Mehlweg. This is literally a few paces across the border in Germany and very close to the Austrian town of Hallein. The directions on this page will get you there. The "Do Re Mi" picnic meadow is located about 25 miles south of Salzburg, just outside of the town of Werfen. The meadow itself is on private land, but the directions on this page should get you close enough to see it. The books above offer more insight in to the making of the film, including more details on the locations I've summarized. Additionally, this page offers a concise guide to the locations as well as an interactive map. I found Salzburg to be perfectly wonderful! Even if I hadn't ever seen The Sound Of Music or gone on the bus tour, there was still plenty to see and do. And the city is just about perfect to get around in on foot. Even the American embassy is inviting! The Golden Arches (aka "The American Embassy").